Preheat the grill for direct cooking over medium-high heat. Combine the vegetables and oil in a large bowl and toss to coat. Spread the vegetable mixture onto the Rockcrok® Grill Stone. Grill, covered, for 14–16 minutes without stirring, until charred. Remove the stone from the grill. Transfer the vegetables to the same mixing bowl and set aside. Layer half of the chips, cheese, black beans, and vegetable mixture onto the stone; repeat layering. 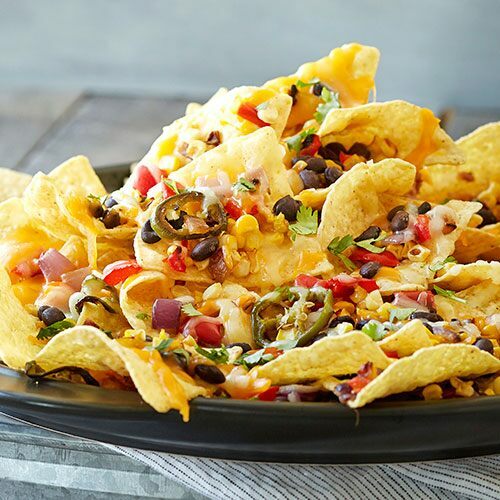 Grill the nachos, covered, for 5–7 minutes or until the cheese is melted; remove the stone from the grill. Sprinkle with cilantro and add toppings, if desired.